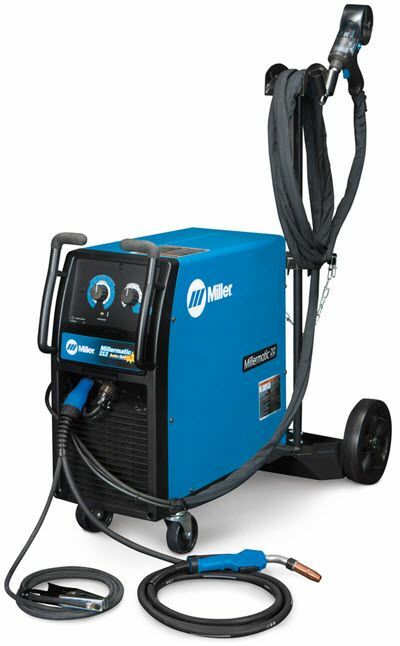 The Millermatic® 212 Auto-Set MIG welder with Spoolmate 200 Spool Gun is a complete MIG welding package that welds material from 22 gauge up to 3/8 in (9.5 mm). It's easy to set up, offers a wide window of operation, and delivers 210 amps of power for semi-industrial applications. 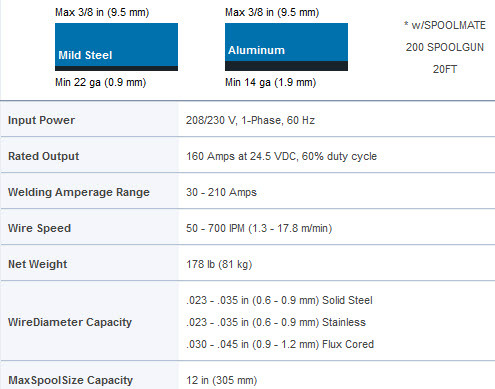 The Millermatic® 212 Auto-Set offers superior performance on thin and medium gauge metals, with smooth arc characteristics throughout its operating range. Aluminum welding set up is easy with the direct hook up of the Spoolmate 200. With Miller's exclusive Gun-On-Demand, simply pull the trigger for either gun and you're ready to weld. Infinite voltage adjustment - when used in manual mode provides broader operating range with finer control than a tap machine. Angled, dual-gear-driven, cast aluminum drive system features no-tool, quick-change reversible drive rolls and easy-to-set, scaled tension knob. Spoolmate 200 spool gun for aluminum welding. Easy to install with direct hook up. And with Miller's exclusive Gun-On-Demand™,simply pull the trigger for either gun and you're ready to weld. No wasted time installing modules and using toggle switches. 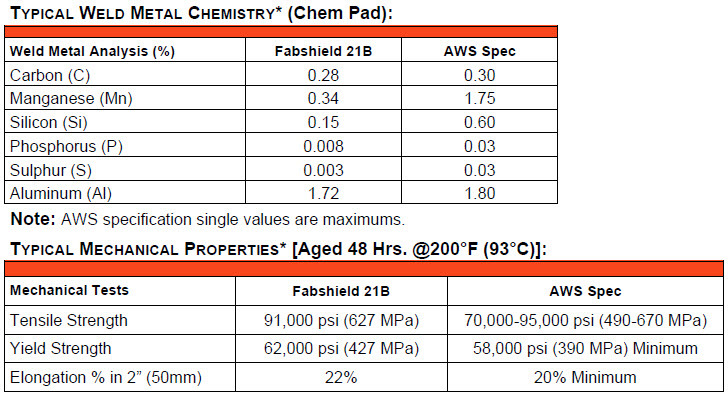 EZ-Access™ Consumable Compartment and Parameter Chart - convenient new flipdown compartment that provides fast access to parameter chart and consumables. Would a 30 amp-220 service be sufficient to run this machine? Yes, based on 208 volt or 230 volt input power, you should have a dedicated 30 amp breaker for your Millermatic 212. 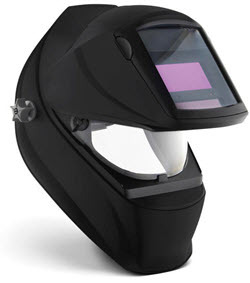 The Millermatic / Syncrowave 210 Protective Cover 195142 cannot be used with the Millermatic 212 MIG Welder Auto-Set with Spoolmate 200 951177 package with the dual cylinder rack and cable holder without modifying the cover. The cable holder prevents the cover from fitting properly. Would i have to buy another gas regulator in order to run 2 different tanks, 1 one for steel and 1 for aluminum, that way i would not have to be switching them? And does it come with 2 separate gas line one for each of the guns? The Millermatic 212 MIG Welder Auto-Set with Spoolmate 200 951177 comes complete with 2 regulators. We do not ship the Millermatic 212 MIG Welder Auto-Set with Spoolmate 200 951177 to Alaska.. The Spoolmatic 30A can be used with the Millermatic 212 MIG Welder . I've been using Miller welders for many years. That's why I decided to purchase another one. I found the auto-set feature to be very helpful, in fact I've been using it quite a bit. Love it and the welder is fantastic. This should be the last MIG welder I will have to buy. The whole experience was very easy! Picked up the product, took it to the shop-removed the welder from the crate and within a 15 minute period, had it assembled and ready for use. Very, Very Nice. Especially nice to have the two tanks on one unit and both the Mig and Spool on this one unit. I have another Miller and had to put in a cooling tank for the Tig outfit. This unit makes it much easier and cleaner. ProsVery simple to use. 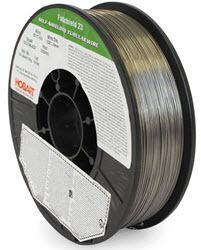 Unlike my other wire feed, this unit saves time and I do not have to think about what steps I need to take to switch from welding metal to aluminiam. I have everything in one and can move my other two welders into a corner for someone else to use.